I've been sent a review copy of the US' # stock picker, Natalie Pace's book, 'Put Your Money Where Your Heart Is', and thought it might be worth a read particularly given that it's endorsed by one of the originators of the human capital concept, Gary Becker. The book reads well, although I'm still a bit suspect about whether one strategy that has worked for Pace in the past will work for me in the future. Nevertheless, there are some suggestions in this book I do want to use to try to make up a bit on the investments I've lost during the last year. I particularly like Pace's suggestion to invest in something I love, something I feel really passionate about. So, given that one of my passions is HCM, and also given my last post suggesting that we need to put more focus on HCM investing, I should perhaps look at investing in organisations which are themselves investing in their human capital and are tracking and reporting on the impacts of doing this. "What it has shown us is that we should invest in any company that hires us. It shows they're serious about their investment in human capital." So this is one thing I could do (I mean I could simply invest in companies that hire me, not ones that hire McBassi & Company!). But I think Pace's book adds some useful structure to this strategy, without what I see as Bassi's overly mechanical approach. "Is a company attracting talented individuals who are on the ball, or do the salespeople look beaten up and word down?" So a human capital-centric investment strategy should be even more successful that a product driven one. So, I'm going to think about, based upon my own knowledge and experience, which companies I believe are going to be the most successful over the next few years. Pace also provides a range of practical tests (a stock report card) to apply to these companies as well, and warns that even in a normal year, it may not be worth investing until September. But then shares have fallen so far, there are clearly possibilities that they may now start to rise, albeit this may not be far and it may not be fast (I've just been listening to the Davos crew discussing the "lost decade" of low growth - depressing stuff indeed). This week I've been focusing on my client work, so rather than going to Davos, I've just squeezed in a seminar on management 2.0 and have also linked up to a couple of webinars organised by HR.com as part of their HCM Investors Forum, running alongside their Employers of Excellence and Mega VIEW events in Las Vegas. The forum featured HCM investors, senior HR Executives and HCM solution providers, reviewing the trends and opportunities in the "Human Capital vertical space" worldwide. The event didn't seem to be that well attended - the current economic environment will have obviously contributed to this. But I guess, particularly in this sort of area, quality is more important than quantity. And speakers still mostly concluded that are still significant opportunities in this space. I just think it's a shame the event didn't do what it said on the tin - and focus on investing in true HCM opportunities (organisations which are themselves investing in their human capital and are tracking and reporting on the impacts of doing this) - rather than simply on investment in HCM technology providers. Perhaps this could be a focus for next year's conference? Are UK HR bloggers Your most influential? 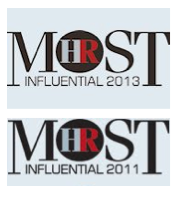 The UK's HR magazine is once again looking for nominations for its HR Most Influential rankings. 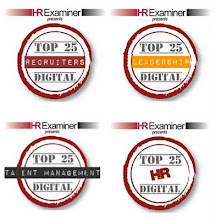 This ranking supposedly identifies those who have had the biggest impact on the HR community's thinking and practice over the previous 12 months and judges attributes such as influence, relevance, visibility, originality of thought, clarity of idea and demonstrations of leadership (?). With the increasing awareness of social media within HR, it would be great to see some UK HR bloggers in this list. So am I, through this blog, or through other means, one of the people who have influenced you the most? And if not, how about Jackie Cameron, Susanna Cesar-Morton, Richard Donkin (who was #9 last year and I think will get on anyway), Andy Headworth, Nick Jefferson, Queen of the Comments Jo Jordan, Jane Knight, Chief Ranter Scott McArthur, 'Rick', Don Taylor or Louise Triance? To register your most influential HR people for 2009, email mostinfluential@hrmagazine.co.uk with the names of the two or three people who have made the biggest impact on you in the past year (the categories are most influential HR thinker, and most influential HR practitioner). Closing date is 6 February. Remember the 2006 Leitch Review and the 2007 Skills Pledge? As I described in a 2007 post, and elsewhere, these were early attempts by the UK's new PM, Gordon Brown, to stimulate productivity through significantly enhanced skills. This Review has itself now been reviewed by a House of Commons Committee, and their conclusions published as the 'After Leitch' report. I'm not going to post an extensive review of the review (of the review), which you'll find elsewhere, for example on Training Zone. But as I was a supporter of the original Leitch Review, and the new review is fairly critical of this, I think I should comment on some of the key points. Firstly, this latest review notes that as the UK's economic climate has worsened, government targets and investments need to be revised. This is self-evident, and I don't think the fact that Leitch failed to anticipate the changing economy detracts from his work, or his conclusions. It's just that, short-term at least, we may need to make some changes in priorities (eg upsklilling to reskilling). Secondly, yes, the UK's skills infrastructure is still a bit of a mess ('a pig's ear or a dog's breakfast'), and it's still not effectively employer led. Again, I don't think this is Leitch's fault. These are longstanding issues, dating back at least 15 years to when I worked for one of the UK's Training & Enterprise Councils, which were designed specifically to help bring training and business together (actually, the issues probably go back at least twice this long). Some of Leitch's recommendations are still in progress, for example winding up the LSC, and I think we now need to see whether these changes (obviously implemented with sufficient flexibility and communication etc) do effectively simplify and improve the system. But my main point refers to the Committee's conclusions that the Leitch review was unduly optimistic and its targets unrealistic and unachievable. I think it's a shame if we move away from these targets. And I think they could be achieved, with the right political will and stakeholder engagement etc. Yes, it's a shame that they focus so much on qualifications, but without these surrogates for skills increases, there would be even more questions about whether higher skills actually deliver increases in productivity, something the House of Commons Committee has already noted as a further concern. I'm sure there is a link between skills and productivity, but I'm equally as sure that it's going to be indirect and long-term. Scaling back too far now is going to cause us more problems later on. And we're still going to need world-class skills to deliver productivity improvements and pay for Gordon Brown's current splurge. I've already commented on the fact that, amongst the cuts, many businesses are still investing quite heavily for the eventual economic upturn. I think that with the skills agenda at least, the UK government needs to do the same. Last week, I briefly reviewed Ed Lawler's recent book, Talent, and explained that this really focuses on human capital management (or using Lawler's phrase, becoming human capital-centric). 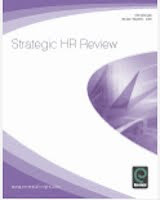 Angela Baron's and Michael Armstrong's book on HCM presents the CIPD's research and approaches in this area. This sees measurement as central to HCM, with taking measurements as the starting point in an HCM process, and developing HR internal scorecards; HR management objectives; human asset worth and human capital scorecards as key steps in the HCM journey. 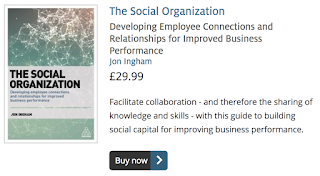 The book starts by explaining that HCM 'is about creating and demonstrating the value that great people and great people management add to an organisation'. However, despite this, there is little in this book to help organisations create this value (I guess the book's sub-title: 'Achieving Added Value through People' says it all). Michael Echols, Director of Bellevue University's Human Capital Lab also focuses on measurement (particularly of learning) in his book, Creating Value in Human Capital Investment. But I think he gets closer than the CIPD to providing a compelling theory for HCM. The key to this seems to be Echols' proposition (which I would agree with) that CLOs must treat intangible asset expenditures as future-revenue bearing investments. Investments in intangibles like human capital, therefore need to be treated in a different way to investments in other things. Bradley Hall's book, The New Human Capital Strategy, is subtitled, 'Improving the Value of Your Most Important Investment' and defines HCM as 'a system designed to create sustained competitive advantage through people' And I think it does get closer to creating value (the long-term aspect of his human capital blueprint). 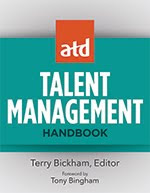 However, just as Lawler's book on talent really deals with HCM, this one often focuses more on talent management ('improving the people in critical roles' more than it does on HCM. And it also falls for the biggest elephant trap in HCM: that organisations 'need to measure and manage human capital with the same discipline as financial capital'. My own book, Strategic Human Capital Management: Creating Value through People, also focuses quite heavily on measurement, but I hope that it succeeds in putting measurement in its place, and also provides processes, tools, examples and suggestions for actually creating value from human capital, as well as simply measuring it. If you enjoy this blog, you'd enjoy the book too. I've been feeling a bit uninspired over the last few days, hence the lack of posts. So, finding I had a few spare hours between clients this afternoon, I decided to pop into the British Library, which always perks me up. It was a bit more difficult than usual to get into my normal reading room, Humanities 1, as my card had just run out and I needed to get a new one, and because all of the lockers were full and there was a huge queue for the cloakroom. But then I managed to get the last desk in the room, so it could have been worse. I managed to get a look at Ed Lawler's recent book, Talent, which I hadn't got around to reading last year. And I expected to be thoroughly re-energised by reading about my pet subject: human capital management (I remembered Lawler explaining on the Engaging Brand last year that the book really should have been called Human Capital, except that this would have meant that only academics would have bought it - unfortunately rather too late a lesson for me!!!). Leadership is shared, and managers are highly skilled in talent management. So this isn't about changing a couple of processes, it's about transforming every feature of the organisation. Lawler explains that it is by making human capital this central that getting and using the best people can become a source of competitive advantage (ie in my language, can create value). I agree with all of this, but I didn't learn an awful lot more. As a long-time fan of strategy+business, I've been reading some of Booz & Co's free ebook, Capturing the People Advantage: thought leaders on human capital (hat tip to Gautam Ghosh). And having just posted on Gary Hamel's latest thinking, I was particularly interested to see the article by Hamel's previous co-author, CK Prahalad, which comes to some fairly similar conclusions as Hamel. Given Prahalad's background, and current focus on the bottom of the pyramid, it's understandable that he focuses heavily on India in the article, and in particular, its IT and consulting companies, but there are still plenty of good, more general points in the article as well. And I presume this is a republication of an earlier article, so it's no reflection on him that he supports his claim that the unique advantage today is human capital by noting that "there is a lot of money floating round", which as we all know, there just ain't currently (at least he didn't include a glowing case study of Satyam!). "The first task is to build an intellectual agenda. It must be at least intellectually challenging, and appeal to your emotions, either to your nationalistic identify or to your sense of what is good for humanity." "Resources can no longer be contained within the firm. So resources - talent or materials - must be available globally. Second, access, not ownership, is important. That means you may not directly employ any of this talent." "The capacity to work together towards common tasks on a programmatic basis. Business consultants know this instinctively. You don't assign people to the same job; every consulting project gets a different team. The real issue is, How do you pick the right people for a specific project? How do you integrate into the team rapidly so that the frictional losses in becoming and operating as a team are low?" Outside India, Prahalad says that are not that many companies he knows that have elevated HR to a strategic role. Have you truly managed to in your organisation, and if not, what are you doing with purpose, human and social capital to enable this? The New Year's first carnival is up at Gautam Ghosh's White Spaces. My favourite post is Rick's from Flip Chart Fairy Tales, rated for its topicality and importance. Rick asks whether HR professionals are ready for the recession and quotes the CIPD's prediction that 600,000 jobs will be lost next year and that the redundancies will continue into 2010. In fact, they think this year will be so difficult, they suggest HR will seem more like ER (hospital emergency room rather than employee relations I think)! "The organisation (the Chartered Institute of Personnel and Development to those not in the know) says an average redundancy costs employers £16,375 before any savings are made, and that it's much better to hold on to employees and plan for recovery. Its chief economist John Philpott points out that redundancies come with a number of direct or hidden costs, especially when hasty firings ‘have to be quickly reversed by renewed hiring when economic conditions improve'. The CIPD's advice: companies should ‘hold their nerve'." My experience at the moment suggests companies are doing just that. I was talking to one of my clients earlier today who said their main focus was on planning for the eventual upturn - and I'm noticing lots of other organisations doing this too. I hope it continues - with this degree of optimism, we may yet be able to talk ourselves out of a recession as deep as the CIPD fears. This month's Management Today carries an article on Gary Hamel's thinking around Management 2.0: 'Corporate Apocalypse'. I think Hamel is leading some of the most exciting research currently being undertaken anywhere, and want to summarise some of this here. "The bomb that has blown up the heart of the world's financial system was not primarily financial. It's true that finance provided the high explosive in the shape of the structured vehicles, collateralised debt obligations (CDOs) and derivatives devised by the rocket scientists of Wall Street and the City. But it needed a detonator to set them off: the unfit-for-purpose management model that has governed the way our companies work for the last 40 years." "The need for companies to articulate a purpose beyond making money (a conference near-consensus), distributed leadership and strategy- making, the fostering of community and citizenship, building trust"
"Tools and techniques for harnessing the 'wisdom of crowds' - crowdsourcing, information markets, virtual worlds and games - will emerge from Web 2.0." "Trust - an abused word, but without which no lasting relationship is possible. Reinstating requisite trust between investors, consumers, suppliers and company is an essential part of Management 2.0." "Re-orienting management from compliance to creativity, from flogging efficiencies out of existing resources to generating new ones, from zero-sum to positive-sum by recognising." In 2009, this blog (and its sister blog) will continue to help readers create value out of purpose, organisation and human capital. I hope you'll keep reading, and if you want to subscribe in your reader, my blogs feeds are http://feeds.feedburner.com/JonIngham and http://feeds.feedburner.com/Social-Business. Hamel's blog and feed are at http://blogs.wsj.com/management and http://blogs.wsj.com/management/feed. The last carnival of 2008 is up on Peggy Andrews' Career Encouragement blog. Take a look!